Pup Scouts Discount! Bring your Pup Scouts Id and get $5.00 back at the event! 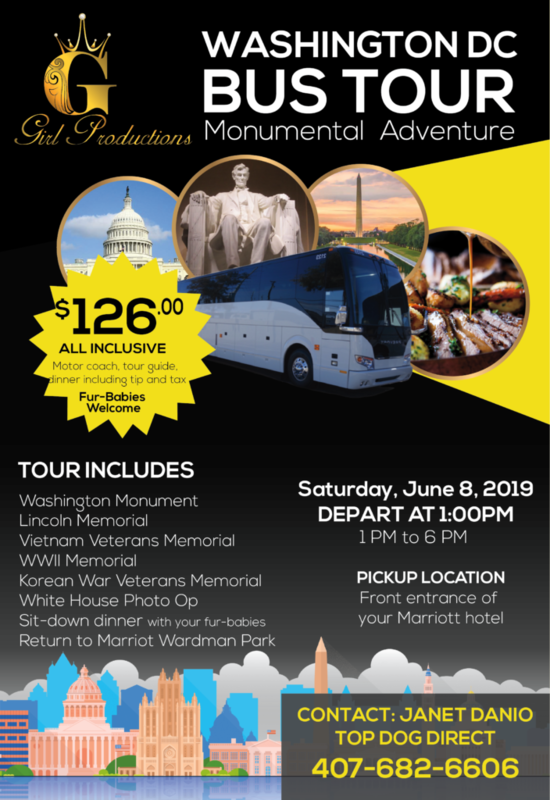 Join the G Girl Family Pre-Event Sight Seeing Tour! Booking information is on flyer. As G Girl Productions has started expanding into venues around the country more and more people are asking “what is G Girl?” “How did this get started?” “Why is G Girl doing these events?” These questions along with “wow that’s really wild” and “who would have ever dreamed?” For anyone who really knows Laura Souza all of those questions and more are quickly answered and it all starts to make sense. Laura isn’t just a crazy doggy mama with a good heart. She has a background that would astound many. Most of her life she has been involved in “show business” and the performing arts having studied under the best in the business and performed around the country in musical theater and opera productions that would impress any aficionado of music and theater. Her educational background includes study at the American Academy of Dramatic Arts, at Herbert Berghof Studio in NY with Uta Hagen, Circle in the Square in NY, with Lee Strasberg at Lee Strasberg Actors Studio in NY, with Michael Kahn, and a master’s degree in fine arts from NYU. She has performed in well-known productions around the country. To mention a few…Sound of Music, Evita, Pirates of Penzance, Oliver, Hello Dolly, Annie, Oklahoma, Nine, Best Little Whorehouse in Texas, Bye Bye Birdie, You’re a Good Man Charlie Brown…the list goes on and on. After sadly losing her voice due to surgery complications, she taught for a while at the university level. 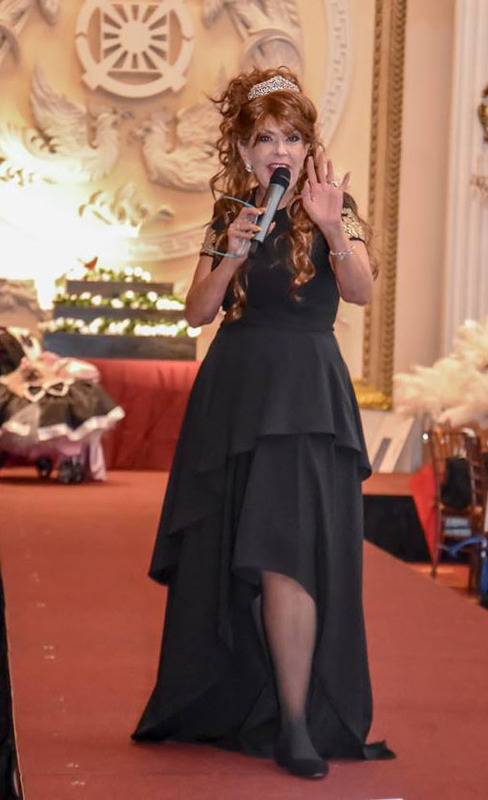 So when you wonder how our “fairy godmother” Laura comes up with all of her “crazy ideas” for what the next furbaby ball or cotillion will be, it all comes from years of creativity, performance, and most of all love for the furbabies who benefit her many efforts for the rescue community. Her events are truly a production and entertainment for all who attend. Thank you Laura for using your many skills and your heart of gold to help so many furbabies and to provide a source of entertainment that soon the world will know even more about. 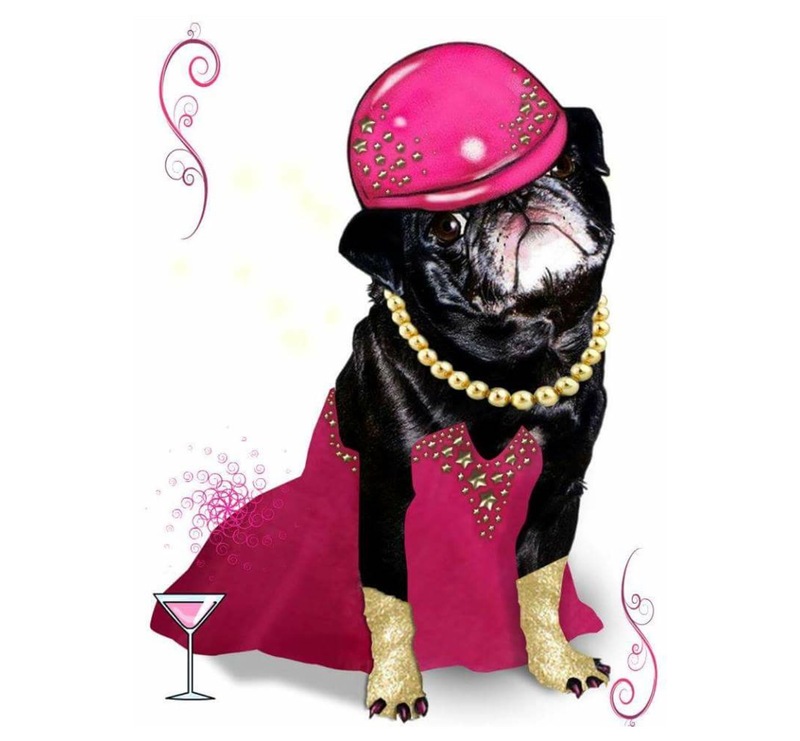 Pugs for Pinky is a 501(c)(3) non profit organization, founded by Lisa Kerner in 2012. MISSION STATEMENT: No pug will be euthanized because the owner can’t afford medical treatment. We help provide medical treatment for pugs who need emergency care. Pinky was born on July 22, 2005 to her pug mom Rose and her pug dad Herbie. She was the first born from a litter of four. She was a big sister to her two brothers Porky & Rio and her sister Ruby. In December of 2009 at the age of 4, Pinky started having seizures. At first the vets thought she had epilepsy, but on April 27, 2010 she was diagnosed with a brain tumor. My life quickly became Pinky’s world. She was with me 24/7. With me being a pet sitter, she was able to come to work with me everyday. She wore a little pink helmet to protect her head. I would dress Pinky in her pretty pink dress and pack her little snacks, on days that it was too hot, I would drop her off at my vets for the day. At home, she slept beside our bed in a soft padded pink playpen and wore pink bells to alert us of seizures. she had her own pink alarm clock set for 7 AM & 7 PM, she’d come running to me every time the alarm went off knowing it was pill time, (with a treat of course). Pinky was such a strong ‘lil pug with the will power to fight. We did everything we possibly could to help her, but in the end the tumor won the battle. On july 25, 2010 Pinky crossed rainbow bridge. Group rate of $179.00 available until April 11th, 2019. Subject to availability. These awesome companies support us! 2019 Leather and Lace Homecoming Dance. Sheraton Suites Fort Lauderdale at Cypress Creek. 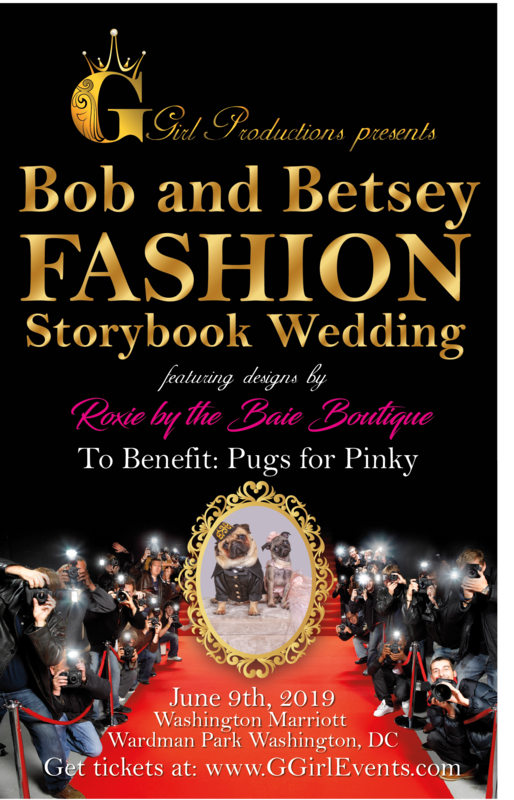 G Girl Fashionistas Rock the Runway for Canine Rescue featuring BarkNBoujee Canine Couture. December 1st 2018 at the W Hotel Buckhead, Atlanta GA.
G Girl Cotillion August 2018 at the New Yorker Hotel, New York. Be the first to know about the fabulous G Girl Productions events. Never miss an event. Register now!